Mackaya Bella Guest House - Glenwood, Durban Accommodation. 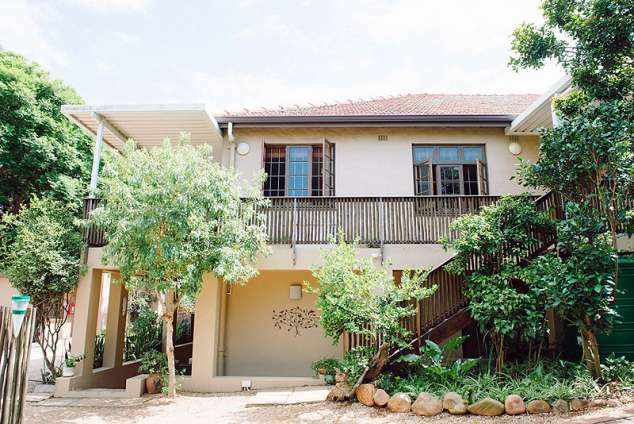 Mackaya Bella is an established 4 star modern, eco-friendly bed and breakfast, situated in the newly revitalised suburb of Durban South, close to numerous restaurants, galleries, cafes and boutiques. Set in a peaceful indigenous garden, the guest house allows visitors a calm and quiet space in which to unwind and relax. The name Mackaya Bella is derived from an indigenous shrub known to KwaZulu Natal, which thrives in the cool, shady ecosystem of the coastal forests. This indigenous theme of relaxation and tranquillity flows not only through the guest house setting, but also encourages the vision and drive of the establishment. Mackaya Bella has 6 modern en-suite bedrooms, with an additional, spacious, one bedroom family room, that can be utilised for long term leasing. All rooms are serviced daily. Safe surrounding area that allows guests to explore the quaint and entertaining social side of Glenwood, ranging from 'around the nook' restaurants to art galleries and boutiques. Small, free standing room for those on a budget. Sleeps one person only. Single bed, microwave, bar fridge, kitchenette and separate entrance. En-suite and free WiFi. Includes Buffet breakfast only (cereal, yoghurt, fruit salad, toast, juice and tea/coffee). Ideal for long stays and discounts apply if booked for more than 2 weeks. Mackaya Bella Guest House is within walking distance of the Howard College campus of the University of kwaZulu-Natal (and shuttle bus to the Westville Campus), the Nelson Mandela School of Medicine. It is also within easy access to the Durban University of Technology; Inkosi Albert Luthuli, Westville, Entabeni and St Augustine's hospitals and shopping centres such as The Pavillon, Musgrave Centre, Davenport, Glenwood Village and Queensmead. Also in close proximity are the CBD, ICC Durban, the beaches and uShaka Marine World. Sporting facilities include Moses Mabhida Soccer Stadium, Kingspark Rugby, Sahara Kingsmead Crickets Stadium, Queensmead Hockey ground and Westridge Stadium. 8615 page views since 23 Apr, 2015.